I never imagined I would start a blog. Ever! 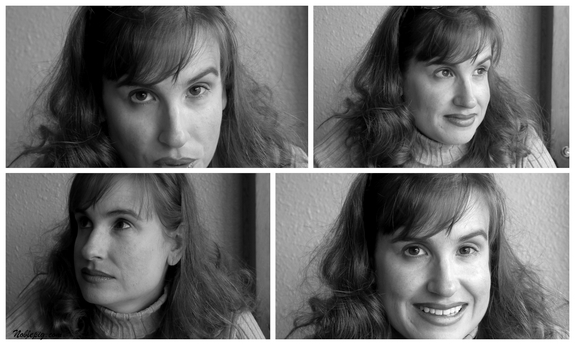 Many years ago (2007) I really didn’t know what a blog was. However, there was an epiphany moment while searching for a recipe on the web that I came across a food blog. I was instantly drawn to the details of this person’s life; her cooking triumphs and failures, her family issues and other mindless, random details. I kept returning to the site and realized there were other sites like hers out there…everywhere. A whole hidden world was taking place everyday on the internet and I had been completely left out of it. There were not only food blogs, but wine blogs, lifestyle blogs, mommy blogs and even blogs about how to blog. I was instantly hooked. All of this made me realize I too wanted to blog. I had something to say and wanted to share the magically mundane, repetitive, boring details of my life. I wanted my own place to inspire, share, complain and learn. I had no idea this hobby blog would turn into a full fledged business of its own. What an incredible gift it has been. The Noble Pig is a place for me to write about food, family, my wine, lifestyle and travel (my interests are too far and wide to be limited to one thing). Welcome to my site and my life. I didn’t always love to cook. In fact, as a teen I paid little attention to anything going on in the family kitchen. It wasn’t until my early twenties that I suddenly took a real interest in creating food from scratch. I learned to cook by following recipes. Once I mastered certain techniques, I felt comfortable putting my own spin on things and creating meals specifically to my tastes. I think my first cookbook was 365 Ways to Cook Chicken, remember that one? About the same time I was learning to cook, I also caught the wine bug. My husband and I had taken many trips to the Napa Valley in Northern California. Needless to say I became fascinated with the science of winemaking. I was learning so much about wine on these trips and it’s all I thought about while back at home in Southern California. 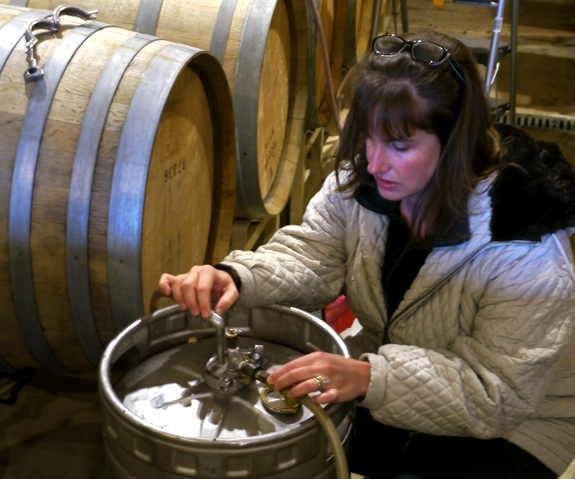 At that point in my life, winemaking seemed like an impossible dream, but one I thought about often. Fast forward many years and two kids later, an opportunity arose for me to return to the classroom, this time studying Viticulture & Enology at the University of California, Davis. I honestly could not believe I was going to attend this prestigious program and delve into the nitty-gritty of making wine and growing grapes. Not a bad gig when it comes to going back to college. Without even blinking, my husband and I packed up the kids and left our life on the coast for my university adventure in Northern California farmland. While I completed my studies at UC Davis, we searched the West Coast extensively for vineyard property. As challenging as it was going to be, I wanted to grow and make small lots of handcrafted Pinot Noir. Pinot Noir being one of the toughest grapes to grow and craft into wine, but I was definitely up for the difficult road ahead. The Willamette Valley of Oregon was really the best place to do just that. And right before I completed my degree, we closed escrow on a beautiful piece of property in the McMinnville AVA, about 60 miles southwest of Portland, Oregon. We purchased the vineyard land from a logging company who had recently logged the property. We were left with tree stumps and lots of debris and it was going to take some pretty extensive work and time to get the land into vineyard-plantable shape. While all of this was happening, I needed something to keep me busy, something more creative than just stump removal. As I mentioned before, I had just discovered food blogs, this was way before social media in the sense we know it today. In fact, in the early days of blogging we had to visit each other’s sites and leave comments to let each other know we existed. We took pictures with point and shoot cameras (no lighting) and grew our communities slow and organically. I wanted a food blog to get me through the long period of time it takes to grow grapes and make wine. However, I never imagined this blog would have taken off so quickly and grown to the epic proportions it has today. Again it has been a dream. The fact it has become its own self-supporting business amazes me. It was only supposed to be a hobby! I was/am very lucky. And because of this platform, I was able to sell out my first vintage of wine to all my loyal readers, shortly after it was released (before I even had a tasting room). What a blessing. This irresistible outlet of writing about food, lifestyle and travel balances my creative side of thinking, with my more scientific side used for making wine. For me, it’s the best of both worlds. With my extensive sensory training from my days in enology school, I have a unique sense of what flavors come together well. This helps so much in the kitchen when creating something innovative and new is on the line. I have been humbled by having my writing and recipes featured in the Chicago Sun-Times, the Huffington Post and all kinds of other wonderful publications. Working with brands, writing on their blogs and developing recipes for their products has also been especially rewarding. Have I mentioned all the fun freelance projects I get to work on behind the scenes? 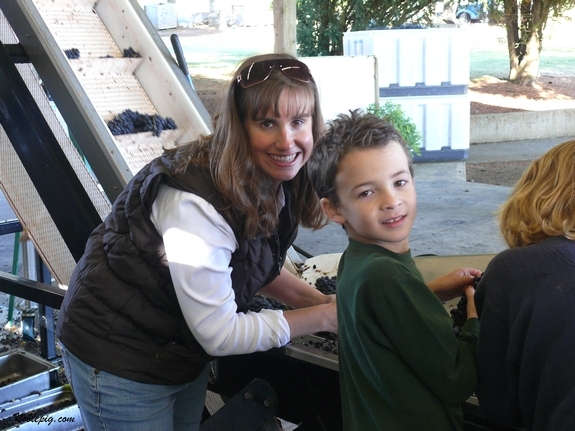 AND, I get to do this in one of the most beautiful, picturesque parts of wine country, while I make and grow wine. Is this really my life? If I’m being honest, it‘s not without the support of my family that I have been able to take this amazing journey. They have allowed me to follow my dreams and take risks with complete freedom and zeal. I wouldn’t have gotten here without them. 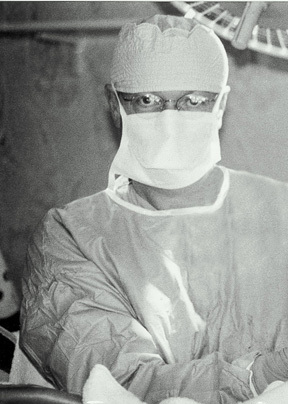 My husband is a retired OB/GYN physician. He is the enabler of all my creative passions and the resident guinea pig for all my recipe testing and the lucky first taster of all my wine. It is only through his unwavering support and belief in my abilities that I have been able to accomplish so much in my life. I would do this crazy life all over with him! Benjamin Pollak is my oldest son (and my right-hand man). 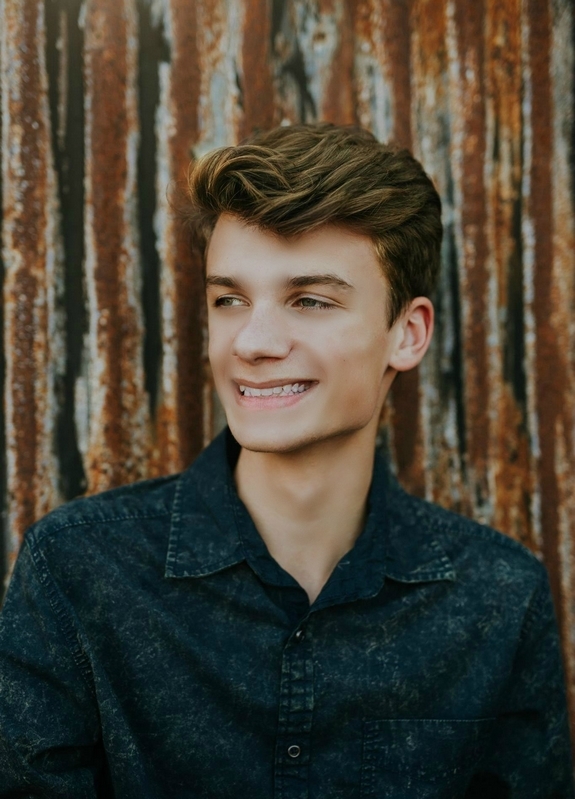 He’s currently seventeen and getting ready to spread his wings in college. I’m not sure what I’m going to do without him as he has been a constant in the winery, vineyard and a part of this blog since their inceptions. His curiosity, willingness to learn new tasks, take on challenges and lead in all aspects of our family business has been a blessing. It has been a pleasure working side by side with this guy and watching him grow into a leading member of the Noble Pig team. And he’s done this while working so hard in school and maintaining high levels of involvement in many school activities (proud mom here ~ yes, I’m biased). 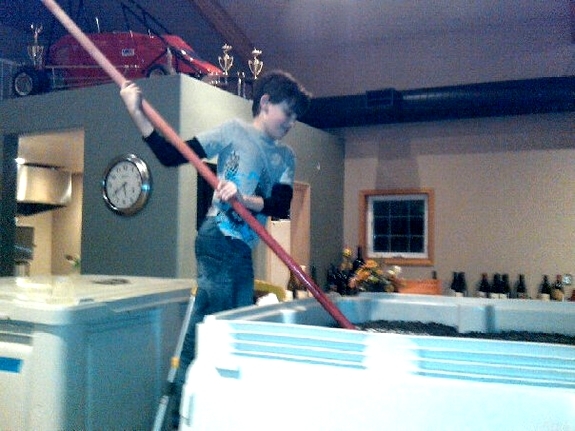 Here’s Benjamin doing his evening punchdowns during harvest. He was quite a pro by his third harvest as seen here. 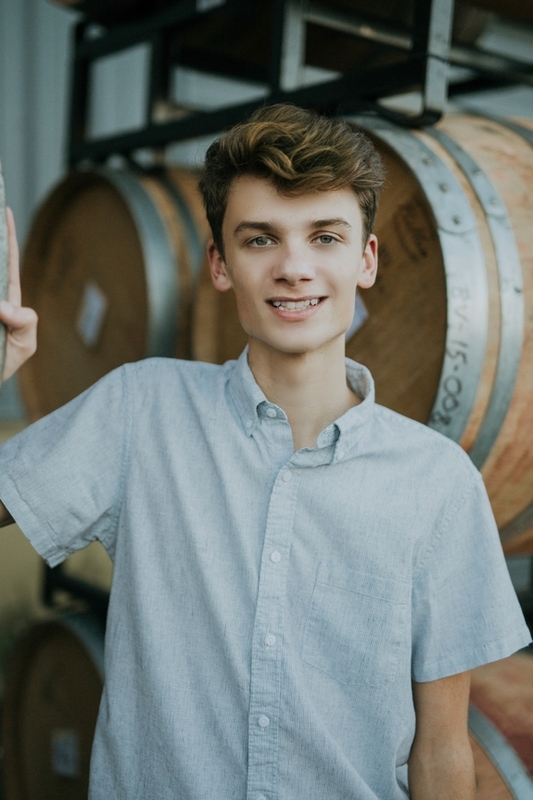 If you’ve visited our winery tasting room, vineyard, received our newsletters, followed us on social media, you can guarantee you’ve run into Ben. If he’s not in the wine cellar filling barrels, running tests and/or a plethora of other cellar tasks, he’s in the vineyard checking on the vines and working with our crew. 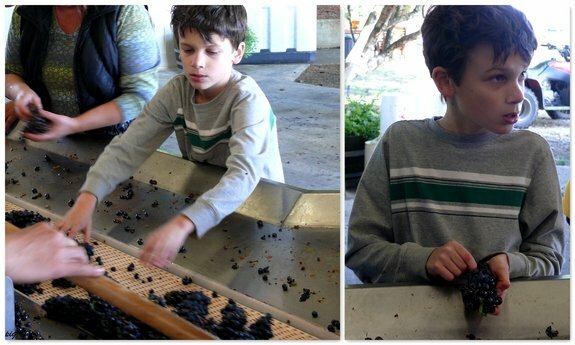 Here he is (above) sorting fruit as it came into the winery during harvest. As mentioned, Ben handles many aspects of the social media required for this blog. Blogging is definitely not a one person task! He also helps me brainstorm new recipe ideas, while keeping up and informing me on all the latest food trends. His ambition and enthusiasm are hard to contain and I love that about him. 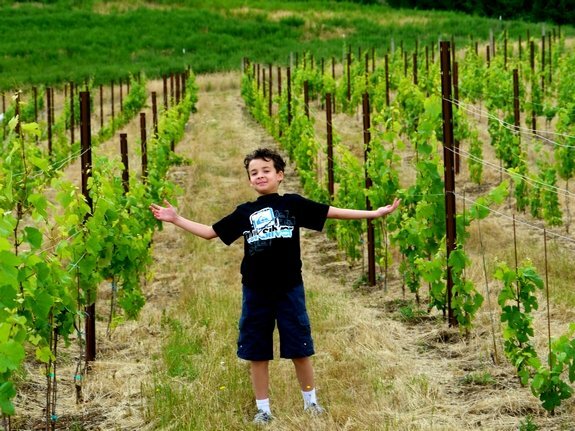 My son Jonathan Pollak is 15 years old (much older than this picture taken in our vineyard) and my number one guy when it comes to checking on vine health in the vineyard. He has become an expert in identifying vines that need extra care and attention. An absolute must in a vineyard situation. This guy is also a genuine super-taster, I mean he has such an acute palate he can pick out two varying brands of apple juice when asked. I know he could be a winemaking star as his palate could evolve into a world-class, articulate, takes no nonsense, winemaking, superstar. A legend in his own right, picking out microscopic wine flaws in single tastes and identifying problems early. What a gift. However, with Jon’s empathetic nature, this straight A student would make a great doctor, but that’s only if his dream of NBA stardom does not work out. Again, I could not do everything I do without his help and constant feedback about how things are going in different aspects of our business. I cannot be everywhere! Click here to see where my work has been featured. If you’d like to work with me, come see what I can do for you. Welcome to the blogosphere–we’ve got you now! Muahahahahaha! Obviously you’ve been doing more than eating over there!!! when will we hear about the rocks left for the maids? off to a great start!!! Cathy- You rock! I am so impressed; you are taking over as the numbero uno place to visit when on the web (our other fun blog-site could fall by the wayside). This is too much fun & you are one talented chick. One more great thing to talk about on those cold morning walks. Neat blog, ma’am. I suspect it’s just your reflection. Your hubby may be wrongly referenced (the wild boar). Unless my (really old) memory fails me, it wasn’t Goldilocks that did all the griping. It was the bears. I’ll stop there, before I get into trouble. I love this blog! I added you to my blogroll! I am just discovering your site; great stuff! 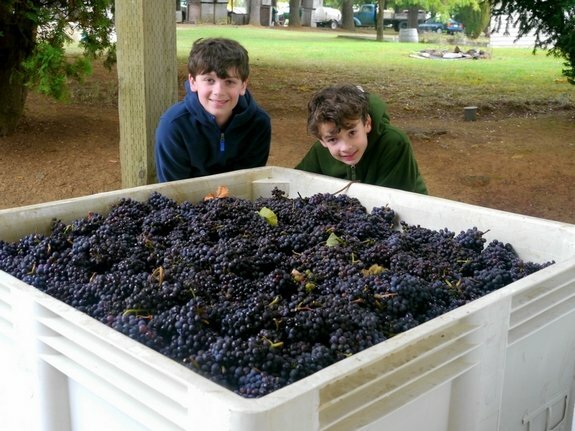 What an amazing dream you have – a winery in the greatest wine region of Oregon! As a wine industry person languishing in the East, I am hungry to hear more about your adventures. Thanks for sharing! I love your humor, looking forward to more…you’re a talented writer. P.S. The cake was awesome! Starting a small vineyard and winery in the Willamette Valley of Oregon? How wonderful! I wish you the best of luck in your new adventure. Creating/planting a vineyard is so much work, unless you’re hiring out the labor. I helped a friend get started once, and it was the 2nd most tiring/rewarding thing I’ve ever done! My whole family was laughing about how you introduced the cake page and why to make it. I just came stumpled upon your page and we all just loved it. Will enjoy reading your blog. Keep up the funny and good work. You have been officially blogrolled on my newbie site as the first of “food blogs I love.” I am so excited that you have property for a winery in the Willamette Valley. My family’s favorite vacation spot is on the coast near Tilamook, and sometimes we take the long, long way and go through the Willamette Valley. And I’m so glad you decided to blog! Your comment about your sensory evaluation class at UCD made me say, “hey, I didn’t know she went to UCD” . . . so I’m happy you wrote this page so I could learn more about you! Hey! Great learning more about you…I love this! Wait. You’re planting a vineyard in Willamette Valley??? How did I not know this!! You are officially the coolest person I know. We have a few things in common – loving to eat (but I don’t think I can like you mention you do), loving to cook, and run-on sentences with no punctuation. Cheers! Best blog I’ve come across by far. Enjoyed reading your words (run on as they may) and look forward to more. I love to eat and drink wine as well. Just couldn’t pass up such a really neat person, who loves to cook and eat, who has a precious family, who really doesn’t need another admirer to boost her self-esteem….but she’s got one. you have a marvelous and totally fun website!!!! Glad to have stumbled across it!!!! Your Hooligan #2 actually eats a greater variety than my Drama Girl and she’s 11! Some kids are just major “overtasters” – if you know the term. I’m subscribing just to see if you can coax him to try more things. Love your blog! What an amazing site that you have! You are funny, a great writer, and your recipes are so sinful that just reading them may ahve damned me for eternity! So since I am already damned, I might as well just try them all. Now need some brown sugar, bananas, chocolate chips, and marshmallows for recipe #1. Cheers! Wow, I now love your blog and add into my blogroll. Congrat on purchasing a land in Williamlett. Great place to grow Pinot Noir. I have been thinking about talking wine making course at UC Davis. Your story is very inspiring. Can’t wait to try your wine one day. I really like your blog, and your self-description. Very nicely done. Hey! We’re getting a Target! And, you can buy underwear at Gottschalks until then! Did you know the toads don’t even use the tunnel? I have come out from under the dust cloud in my studio and discovered blogs ~ who knew??? I am a fan! I’ve heard about you and your blog. Your writing style is very entertaining – thanks for making us laugh! Welcome to DLM; you’re a great addition! Totally hillarious you are…I shot a wild boar once…it made an excellent pappardelle con cinghiale (don’t grade my spelling). Glad to have found you. Your younger son sounds like my oldest grandson, almost 3. Very particular about food and who does what with it, like he needs to put on the ketchup. As for me, food and wine, who needs anything else? Food and wine and children with peculiar and particular tastes. Sounds like my life. So I have no recollection of how I heard about your blog, but man-oh-man I am so glad I did. You are officially my new favorite blog and I will add you to my links and tell readers on my blog to come and visit you. You are hillarious and a wonderful writer and my new escape during the work day. I love it! I just came across your blog for the first time- only to find a wonderful blog but also Nararro. I was borne and raised in Fort Brag, I now live in the Bay Area, still fining myself up North as my family is all there and I find it quite refreshing to go home. Please consider me one more fan. I’m so glad that I finally got around to reading your about page! I love your sense of humour. Husbands, don’tcha love ’em? Love your blog! I’m pasting a link on mine so others can feel the love! Love your blog! I’m pasting a link on mine so others can be equally entertained and inspired. Wow! Your 6 year old’s description sounds exactly like me! I may not have the same discerning palate, but I am picky and choosy. Seen you around the blogosphere, now I’m here at your excellent blog. Wonderful blog. I am happy to be aboard! I love to visit your blog several times during the week. Your recipes are fantastic and simple all at the same time, and you have a great sense of humor. Good luck on the vineyard! WOW…I’m speechless! I have never subscribed to anything, but after being inspired by your fantastic recipes, superb pics and overall flare of your blog I JUST HAD TO SEE MORE!!! LUV LUV LUV LUV your blog…and I look forward to more great stuff!!!! Great blog, look forward to more. I’m glad to have found you and your blog. Count me in! See, I’m totally enjoying your blog. Snooping around everywhere. Ramble on, girl! You do it well. I just came across your site today! I love it! I will be coming back to visit! I just laughed and laughed. I, too, am new to blogging and you have may more figured out than I do. I am trying to figure out how to customize my blog page with element other than presented at blogger. I enjoy your header-the name is what led me to check it out from another person’s blog. I’m adding you to my favorite and linking on my blog just in case anyone ever reads it-hehehe. I ramble too, so feel free to ramble on-it all makes sense to me! Oregon, oh I would love to go live there. I have heard from many how beautiful it is. May need to go check out those vineyards. I just came across your blog completely randomly doing a recipe search. I am so glad I found you. I love your style! The airplane incident you described cracked me up! I know exactly how you feel although I’m obnoxious enough to say “hey get the heck out of my area buddy!”. I’ll be reading your posts regularly. I feel your pain about Davis my best friend lives there and always tells me horror stories. Also I can relate as I’m from an even smaller, quirkier town from even farther North in CA. Good luck with your winery adventure. Oregon is a wonderful place too. I think you would love Ashland which is very near the Willamette Valley. Also a quirky, small town but in a hip kind of way. Ah, a true soul mate! Food, wine and crazy men. And Jewish! We are discussing the change of life thing too. Food related. Oregon, hmmm? My sons are older, but one eats everything, the other is as picky as yours. I love eating, cooking and baking, reading about and talking about food, too, so I’ll be popping by here for a chat regularly. I’d love for you to visit me over at mine one day! I just ran across your blog tonight…referred by Sass and Veracity, I think. It was the scallops and champagne grapes recipe that drew me in. I’m a former store owner in Davis…Tarika and then when I retired, I opened All Things Right and Relevant with a non-profit group. I’ve really retired now…just tutor children who are having a difficult time learning to read and/or write/math, etc. Enjoyed reading about your winery aspirations. Have a home in Ashland, Or., as well as Davis. I call my fiance the wild boar too! I love your blog! Looking forward to ur future posts. I love your blog….do you happen to live anywhere near Red Bluff, CA? It almost sounds like that town. 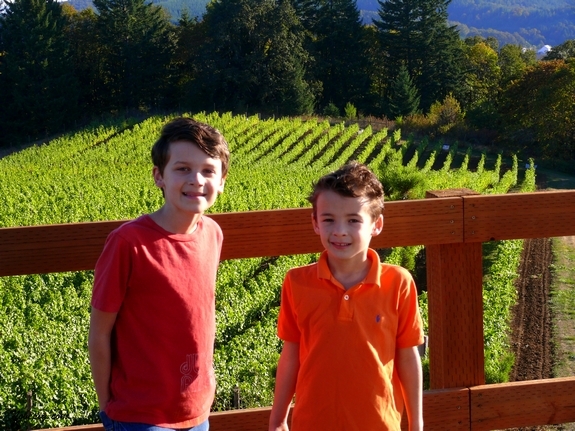 The Willamette Valley is so beautiful–sounds like a person after my own heart. If you’re ever looking for a teacher who also works as a nanny and loves adventure and working with children—??? I love your blog….do you happen to live anywhere near Red Bluff, CA? It almost sounds like that town. The Willamette Valley is so beautiful–sounds like a person after my own heart. If you’re ever looking for a teacher who also works as a nanny and loves adventure and working with children??? Also, I enjoy vermiculture…for better soil and alternative energy, growing things, especially organic, etc. Thank you for such a fun blog and a so yummy recipe! The food is amazing! Love the pics that go with it too. You’ll love Oregon! I use to live in Eugene, we make great wine! I’m up the street in Roseville! Edinburgh to fish eyes in Sarajevo and is the most adventurous eater I know. I used to live in OC. I escaped to nashville and I always complain about the “chain stores.” Your boys are gorgeous. Can boys be gorgeous? I often watch my neighbor’s twin boys who from BIRTH have pushed away food. I felt like I won a prize when they ate my pasta with eggs. Maybe number 2 will be the wine drinker. Enjoyed your story. I will give you a thumb up and come here often..
Love your writing, and would like to subscribe to your blog. Can one subscribe to a blog? I’m new to this. Thank you. Wow, I’ve been coming here for a while now and I’ve never read this! Thanks for letting us in! Your blog is an endless source for excellent recipes, food for thought, and lots of laughs! I love it! Miss, you are amazing! I love to cook, and your blog is full of my favourite ingredients, and food I know I’ll love. I was reading your recipes; there are cool! I always get confused about if it’s the right colour, the right texture… but you are very clear and you make things look easy, too. So thank you. You do it in a wonderful way. I stumbled across your blog and read that you lived in Northern California, as do I. Upon further examination of your explanation of the town it sounds like Arcata. I understand privacy so conformation isnt necessary. I just thought it was interesting and cool that I could stumble upon and great food blog right from my area. Keep up the fabulous pictures! I just found your blog and am rewriting my grocery list as I am skimming through it. So many great ideas. We frequent the McMinnville area, love the Oregon Hotel and the wineries. Hope you will be planting soon and bottling! Can’t wait to follow your winery adventures. Best of luck, especially with the reds! I happened to stumble upon your blog and WOW! I’ve read through it and this is really the most awesome blog i’ve read. You are so funny! I absolutely love it. AND, i’ve got a couple of kiddos myself. One being a VERY picky eater. I am writing down things to get at the store for my visit tomorrow! LOVE your ideas and can’t wait to try making the food! I was on stumbleupon.com and your site came up (congrats). I love the matza recipes and the pie in the sky. I sent it around to everyone. Great site. Funny sense of humor. Thank you. I love to cook, love to eat, love wine. Two sons. One eats everything the other eats nothing. We could have been separated at birth except I’m over 50, French and live in British Columbia. But other than that, I’m just saying. Maybe I can visit your winery one day. I just did a review of a local one up here two weeks ago. Best of luck. Just looking for Ham w/ Coke Glaze, and I found this place. Remarkable. You go to such great effort to express what you see and feel in an inspiring and memorable way. And it made the end of this day memorable for me. Thank you. I love your blog! You’re just so witty, humorous, interesting and I’d love to visit your winery one day. I found your site on a random search, and love it! I live in the Willamette Valley–slightly due east of prime grape-growing region,although the vines are joyfully encroaching on the Christmas tree and berry fields of my locale–but spent 4 years living in the town where you can’t buy underwear. You can however, get a fantastic bagel, and underwear seems to be optional in that town anyway. Prior to that, most of my days were spent in “The Valley Of The Moon” (born and raised, actually. So, I am looking forward to reading you on a regular basis. Thanks for the entertainment! You are hilarious. I am definitely not into checking blogs, but must make an exception in your case. My daughter loves to cook and she needs a better inspiration than I have been lately. Honey – get yourself on twitter. I have foodies there waiting for you! Well, this isn’t Elra – it’s her husband. I’m waiting for Elra to get out of the shower so i thought I’d pay another visit to you site. Actually, I’m quite curious about your winery and also about the Willamette valley. Wonderful to see you pursue your dreams. Elra and I dream of retiring to a winery in Santa Barbara – actually, this is my dream – orchards, olives and wine. Elra prefers to be within yelling distance of her neighbors; i need enough time to get the shotgun after the dogs start barking. Anyway, for now we are stuck in the bay area; actually, shouldn’t complain. i’m doing a startup and enjoying it (except for the fund-raising aspect). If it succeeds then off to santa barbara, although with all the wildfires Elra isn’t sure about this anymore. Well, time to go off to dinner. Thanks for keeping us entertained. Great reading your blog. I love your pictures, food recipes, and a lot of nothings. Live, work, and play in OC and would love to create some of your cookie recipes to sell in my store. Looking forward to reading about your future adventures. My brother (“Bob”–from icookstuff) sent me over here to check out your snickerdoodle ice cream, which I will definitely be making. But it’s the description of your family I especially love! Your hooligan #2 needs to get together with my hooligan #3, who will only eat about half of your son’s list. Where did I get such a culinary heathen?? Cathy – Your brother, Paul, told me about your site. My employer is one of his clients. Paul must know us all TOO well to suggest your site, which is wonderful and your life is exactly what we dream about as we run our calculators. Keep up the good work! I live in Oregon too!! I love hearing about your “hooligans”! My Hooligan 2 is just about s picky as yours. He just turned 6 and as much as I try to get him to try new things, he is totally stuck on spaghetti from a can, chicken nuggets with no sauce, french fries with no sauce, toast with no butter, hot dogs cold in stale pita with no sauce and cocoa pops with no milk. UGHHHHHHHH! So glad I found your blog! I discovered you because I love pigs and pork (yes, both), and because I almost thought you’d escaped the town I live in now: Berkeley. As you probably know Berkeley suffers from the same idiosyncrasies as Davis, even down to the frog-slaughter phobia, except ours is newts. Yup, our South Park Drive (no pun intended) is closed for newt migration from November to April every year. Also my husband suffers from Goldilocks Syndrome, so much so that if you say it around him he will not only know what you mean but he will assume you are referring to him. Oh, and I also happen to be a glutton of the first order, but that’s less unique. Not true anymore. There is now a Target on 2nd street just west of Mace. While I had not heard of the toad tunnel until now, when I read your description I immediately thought Davis! I don’t live in Davis, I just work there. And yes, it is exactly as quirky as you say. I am baking your lemon square/bar recipe right now. They are smelling wonderful. Thanks for the great recipe! Love your blog. I am going to try that apple upside down pie. It looks really yummy. I am totally in love with this blog. I love love LOVE your site! I’m a vegetarian married to a meat-a-vore, and have used TONS of your recipes for our whole family! Thanks for the food, the laughs, the sighs and the awwwwww’s. I love anyone who follows their bliss. Pig is the other white meat. Ha! I am missing the Pacific Northwest. my boyfriend found your recipe for eggs in a breadbowl online on “stumbleupon” and we began reading your blog together. thanks so much for the great recipes, wine advice and laughs! Just what I needed – recipes, reviews, virtual tastings, and aesthetics all on one interesting blog. I am too dependent on French wine, namely Merlot, and would like to break out and understand more wines. I loved reading about you, your stream of thoughts, and of course, your “get back in the kitchen and cook” inspiring recipes! I was totally taken with your post on Baked eggs in Bread bowls. I love making baked eggs with spinach and bacon for weekend brunches…but somehow never even thought to put them into bread bowls. Ur post has been truly inspiring! You had me at ranch dressing macaroni and cheese. I would love to post some of your recipes with credit and link to you on my blog. Is that ok with you? I just Stumbled across your site, and I’m glad I did. Any blog that combines food and words like nincompoop are definitely worth reading through! Looking forward to reading more… Cheers! We LOVE your recipes and pixs! Just shared with our grown kids. Thanks so much! hi! love your blog. i’ve just started a food blog too. i was inspired to do it because of your blog and others like you. like some of your readers, i will be trying out your recipes (will credit and link you of course) soon. I recently disccovered your blog and pictures! They are both terrific and I intend to try many, many of your recipes as soon as possible! Your pictures are professional quality and make my mouth water every time I check in to see the latest dish! LOVE your blog. Thanks for the laughs. Hi. I just read your blog for the first time. Love it. Very funny. You remind me of me! Ha. My Adoptablogger#4 newbie tipped me on to you. She thought I would enjoy your writing and she’s right. Look forward to more recipes and a few laughs! You are amazing following your dreams, not many people get to do that. Best of luck. People deserve very good life and mortgage loans or commercial loan can make it much better. Just because freedom depends on money state. Great blog….Husband and followed our dream from Central Texas to the beaches of Florida! Loving life…cooking…and having fun! Hi Cathy…Just love your blog! My 18-yr old son sent me the cinnamon donut muffin recipe and away I went…searching the blog for other recipes. I, too, love to cook, and, coincidentally, EAT! But alas, my thighs, unlike yours, are extremely good friends! I’ll keep reading your blog…hmmmm…may even start one myself! Thanks for a good read! Just found your blog. Love it! So entertaining and it satisfies my culinary curiosity! Well, first off the shape.Â I also don’t think of focaccia as sandwich bread and ciabatta I do.Â Also, ciabatta has a much crustier top while focaccia is soft and very oily.Â For me they are completely different, especially in texture. Off to read more about you and your fans. I live in McMinnville too! Small world. I stumbled upon one of your recipe articles that started out with “the weather remains wintery, not cold but wet” and I knew you had to be in Oregon. Hah. I’m down in Eugene, but I grew up closer to McMinnville. Food looks good, I look forward to trying the scones, apples and others. Your blog is great! It’s at the top of my “favorite blogs” list. Your recipes are fantastic, and it’s so inspiring how you’re living your dream. Good luck in all that you do! Love your blog! Enjoy all the recipes and the funny stories. You’re a great writer! I have a baking/life/ everything blog 🙂 Feel free to head over and have a read. I just featured your poprock cupcake recipes. Its such a great idea!! I just found your recipe for Mom’s New York Cheesecake with Strawberry Sauce. It sounds wonderful. I am sooo hooked on cheesecake! I want to make this recipe but was not clear on the last ingredient given for the sauce. Does 1/4 c fromboise mean 1/4 cup raspberry JELLY because it doesn’t say? Also… does the 1/2 pint heavy whipping cream have to be whipped before folding into batter or just fold in as is? I would very much appreciate it if you could email me your reply. Thank You in advance. Framboise is a French, raspberry eau-de-vie….available atÂ most liquor stores.Â As far as the cream, you do not whip it. You have a most wonderful site! I really love your photos,recipes and the way you write. I just love it! I stumbled upon your site and I am hooked! I hope to try some of your recipes and start en exercise regime to combat the results! I, too, live to eat good food and I love your hilarious story about the barf baby! Your web site is awesome. I have wowed my wife with many of your recipes. I have had a batting average better that Alex Rodriguez with my new cooking know how. I have one question though. I have 4 little ones and I am reluctant to use wine in some of the recipes. Is it ok? Made properly, foods cooked with alcohol are perfectly safe to serve the little ones in your life. The dish should be cooked long enough, usually several minutes, for most of the alcohol itself to evaporate, leaving only harmless trace residues and the concentrated flavor of the wine or beverage used. When you cook with wine, beer, sherry, and spirits, they can greatly enhance the taste of some dishes, acting as a flavor conductor to heighten the taste of all the ingredients. What a great blog! My friend sent me the link to it (she just made your crazy stuffed pasta concoction!) and I discovered on a picture of your wine bottle that you are in McMinnnville! My daughter goes to Linfield College and so next time I’m in town – and I love to visit McMinnville (especially the fabric store! ), we’ll seek out Noble Pig. Thanks for some really appealing recipes…I hate to bake, but I seem to crave what you’ve been craving lately, so I’m giving some of them a try! Just happened across your blog today. I am currently a V&E student at Davis and just so you know, we now have both a Target and Trader Joe’s. Life is so good. I’ll have to look out for your wine. Cheers! I sometimes feel like there are too many blogs but I am happy that I found yours today. Not only do I love that you had a chocolate chip corn bread recipe but that there is Yiddish being used in the Oregon wine countryside! Thanks for your blog…and if you know of any extra nice single Jewish men please introduce them to us lol! Hi Cathy. I love your blog (OMG that croissant bread pudding was to die for) and am so excited for your wine making success! I am a mom in So Cal (no, not the O.C., S.B.) who is also married to a physician who is slightly concerned with my jabbering on on the internet. I have a food blog too, Yummy Mummy, and will link to your site when I finally get a “favorites” or “blog roll” going. Just found your blog today, via Stumble. LOVE IT, but mainly because I love your style and your openness. You make this an easy pleasurable read. The best food blog I’ve seen yet and one that has encouraged me to move from my cookbooks to online just a touch more. Looking forward to reading and absorbing everything you share. excited to find your blog! thank you for your wonderful recipes and humor! as you can tell from my e mail address i love to eat .i know i will be reading your blog daily! Just found your Blog! Congratulations Cathy for your success! Finally your dream came through. Your blog makes people smile and we are sure that your wines will do the same, and not just because of the lovely alcohol content. I absolutely adore your blog, have just spent the last hour or so looking back through all your posts – your recipes are just amazing! And I totally know what you mean about getting hooked on blogs – I have my own little blog obession happening too, now I must add yours to my list of blogs to visit regularly!